Now, this post was meant to be live in December, but you know life, that old thing - sometimes becomes a little hectic and I haven't got round to posting properly in a while - so I apologise if you're a loyal reader! I've also just started another accounting qualification so I'm back to the juggling of my brain capacity, all fun and games. For those of you who know me I love a good shopping trip and nothing quite tests self control like setting yourself the challenge of 'no spend November' (or any month!). No clothes, no shoes and no accessories for myself. That was the rule. I decided to do this since Christmas was fast approaching and also knowing there would be several important birthdays that would fall within January, as well as a 5 week wait till payday that I certainly needed to consider my bank balance more than ever. The aim was to cut back on spending and teach myself a style lesson in the process. Despite there being so many amazing items continuously being released on the high street.. I simply do not need more clothes (even if I think I do by browsing Instagram!). I have plenty of lovely clothes that still have lots of life left in them and can be styled completely differently - which is why it's so important to shop your wardrobe. I always look back on my Instagram where I have documented a LOT of my outfits. If you're limited to a small wardrobe space like me it can be easy to forget about items, so it's all about organisation and it works a treat once you have a working process and are able to see all items when picking an outfit! I DID IT! I'm quite surprised... (even everyone didn't believe I could do it!) I mean nearly caved on two occasions - a bargain jumper and a lovely pair of boots and I have do admit I did order a few bits on the 1st December (before my boyfriend publicly stitches me up!) but I'd say that was probably deserved since one of my jobs revolves around shopping. The positive to it was that not only did I have plenty of extra cash at the end of of the month, but it highlighted the items that I was in need of the most. Meaning I'm not just spending for the sake of it like it's so very easy to be sucked in to. I have cut right back on my wardrobe and I would say I wear 75% of it now - obviously some of that includes summer items, or occasion-wear but by having a 'capsule' style wardrobe and knowing the styles you love wearing! It makes life SO much easier and I can't recommend it more if you feel like you have a wardrobe full of clothes but never anything to wear. ..Of course, you know where I am if you need any styling help. 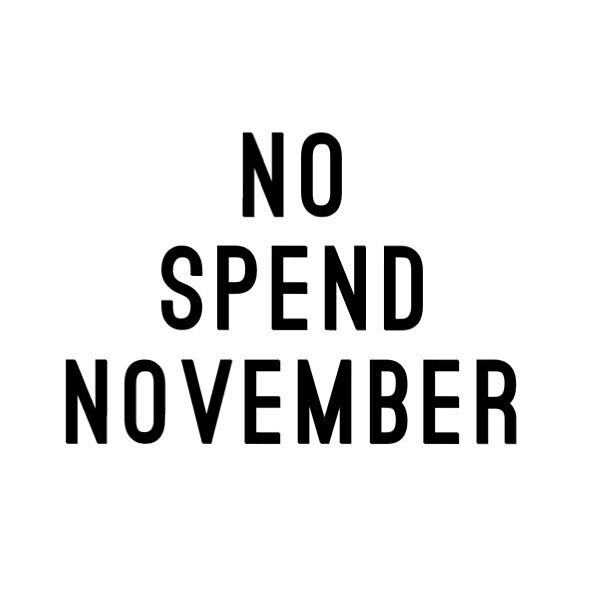 So to all the shopaholics out there.. try a 'no spend' month, you'll be impressed with yourself when you manage it! Plus a healthier bank balance is always a plus, right?